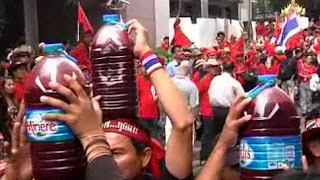 Thailand's red shirted protesters traveled to the house of Thailand Prime Minister Abhisit Vejjajiva. The protesters want to dissolve parliament and call for fresh elections. 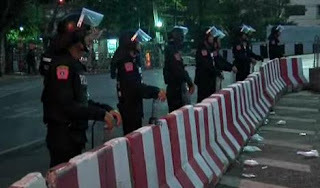 The protesters poured blood onto the Prime Minister's house that represents a symbol of bloodshed for democracy. 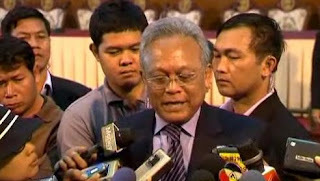 Thailand's deputy prime minister will not bow to the protesters demands. "They can not force us like this to have an election. Then the new government may be able to work for only a few days or a few months and then be forced to leave by protests again. This will be non-stop." The red shirts support the former Thailand Prime Minister Thaksin Shinawatra who was ousted by a military coup in 2006.